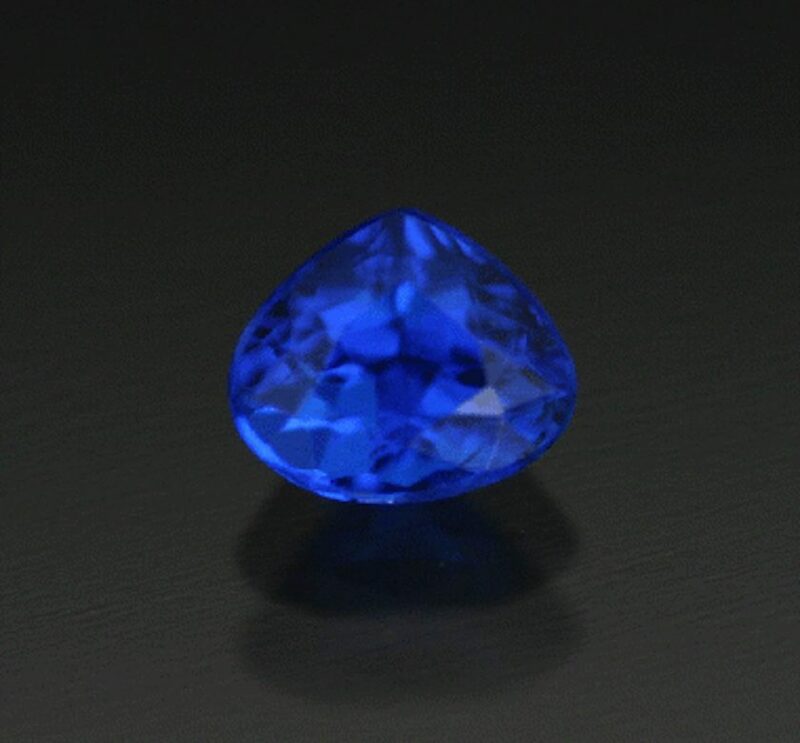 Vivid blue, round haüyne gemstone, 0.35 cts. 4.6 x 4.6 x 3.3 mm, Nedermendig, Germany. © ARK Rare Gems. Used with permission. One of the major mineral constituents of lapis lazuli, haüyne is rarely found and faceted as a distinct gemstone. 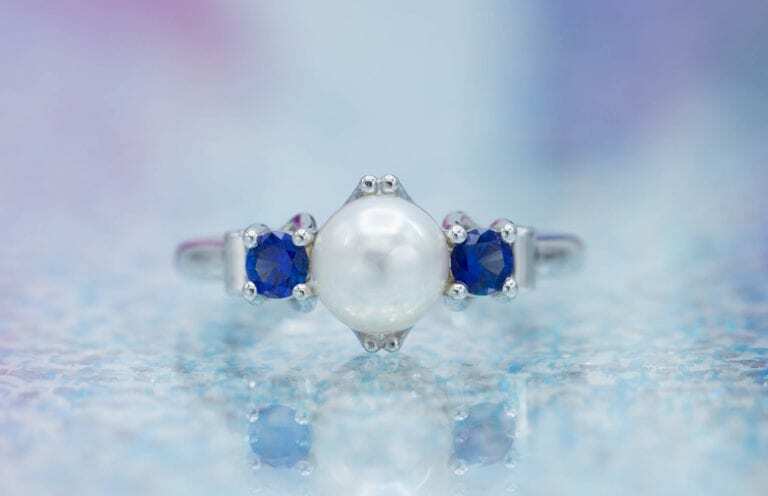 Collectors prize its beautiful, deep blue color, although it can also occur in other hues. Colors Blue; also white, shades of gray, green, yellow, red, and pink. Alternate Common Names Hauyne, hauynite, haüynite. Crystallography Isometric. Crystals dodecahedral or octahedral; usually rounded grains. Refractive Index 1.496-1.505. 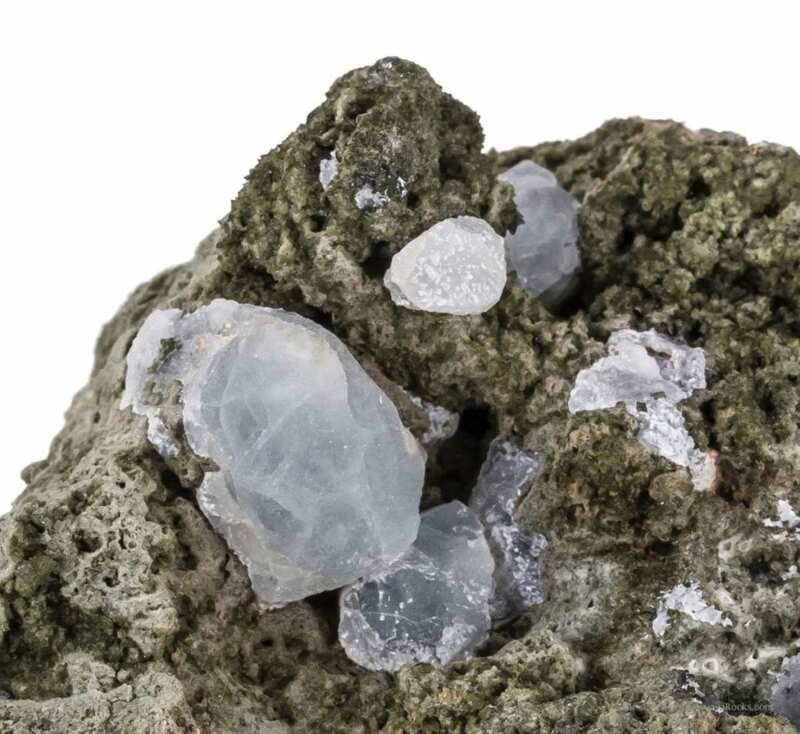 (Tanzanian material: 1.488-1.490). Specific Gravity 2.40-2.50. 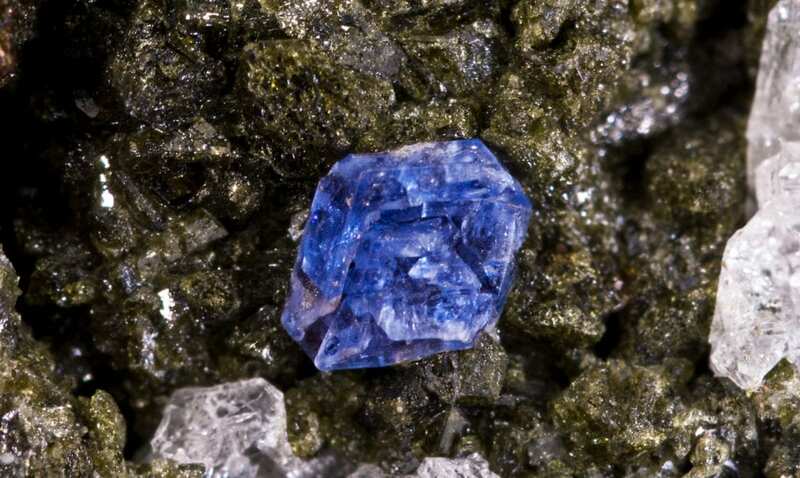 (Eifel, Germany material: 2.40; Tanzanian material: 2.60). Luminescence Usually none; sometimes orange-red in LW (Germany). May show very weak reddish fluorescence to SW UV. Also, light orange in LW UV for Tanzania material. Absorption Spectrum Absorption bands at 380 nm and 600 nm. N = 1.488-1.505. (Eifel = 1.502). After René Just Haüy, one of the great early mineralogists. Alkaline igneous rocks, associated with leucite and nepheline. Healed fractures, crystal inclusions, needles, natural glass, negative crystals, single phase (bubbles). A haüyne crystal (2 mm) with a small gas bubble inclusion in its lower left area. (The pinkish crystals are nepheline; the matrix is augite). San Vito quarry, San Vito, Ercolano, Monte Somma, Somma-Vesuvius Complex, Naples Province, Campania, Italy. Photo by Didier Descouens. Licensed under CC By 3.0. Haüyne (pronounced ah-WEEN) belongs to the sodalite mineral group, which includes sodalite, haüyne, lazurite (a sulfide-bearing haüyne variety), and nosean. Together, these minerals comprise the popular gem rock known as lapis lazuli. 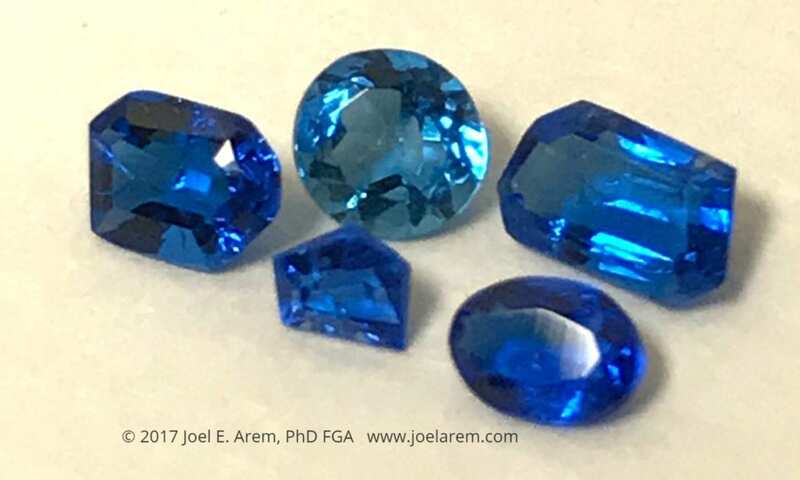 A rare mineral rarely faceted, haüyne is celebrated for showing blue color with vivid saturation. 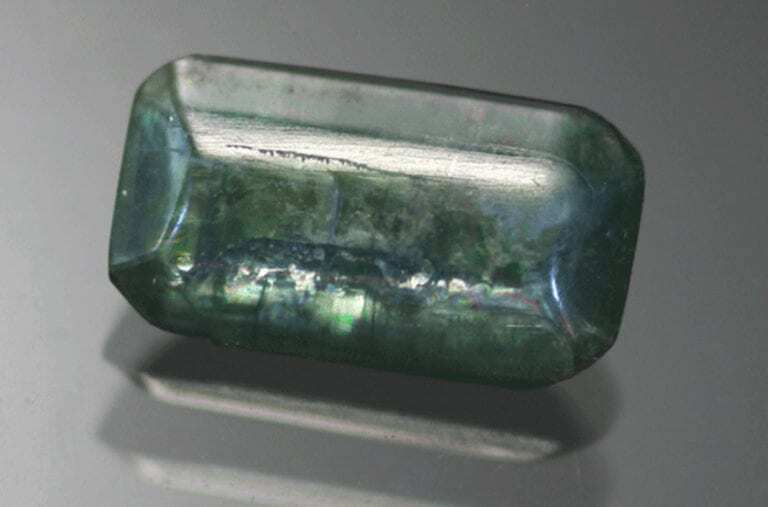 Although haüynes can occur in white, gray, green, yellow, red, and pink, until recently only blue crystals from Germany have yielded gem-quality material. 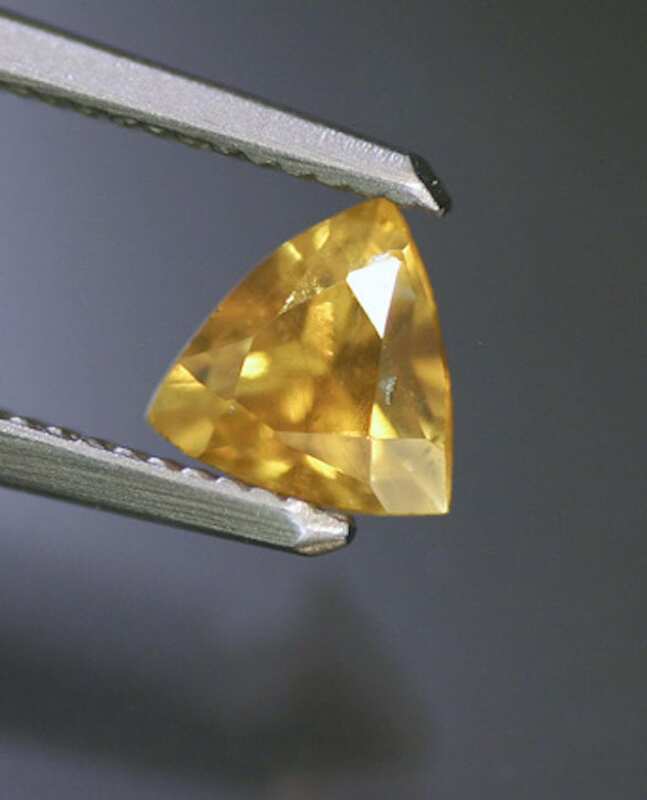 However, in 2003, gem-quality yellow-green haüyne was discovered in Tanzania. In 2006, gemologists documented blue gem-quality haüynes from Afghanistan as well as a blue haüyne-sodalite cabochon from Myanmar. 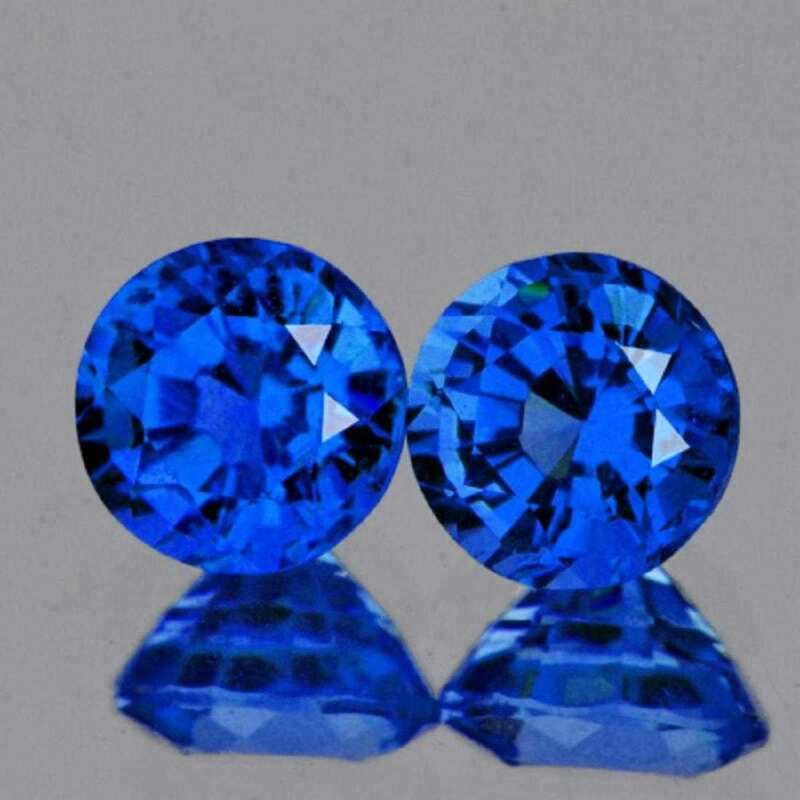 Blue remains the color most desired by gem collectors and jewelry enthusiasts with a taste for rare materials. 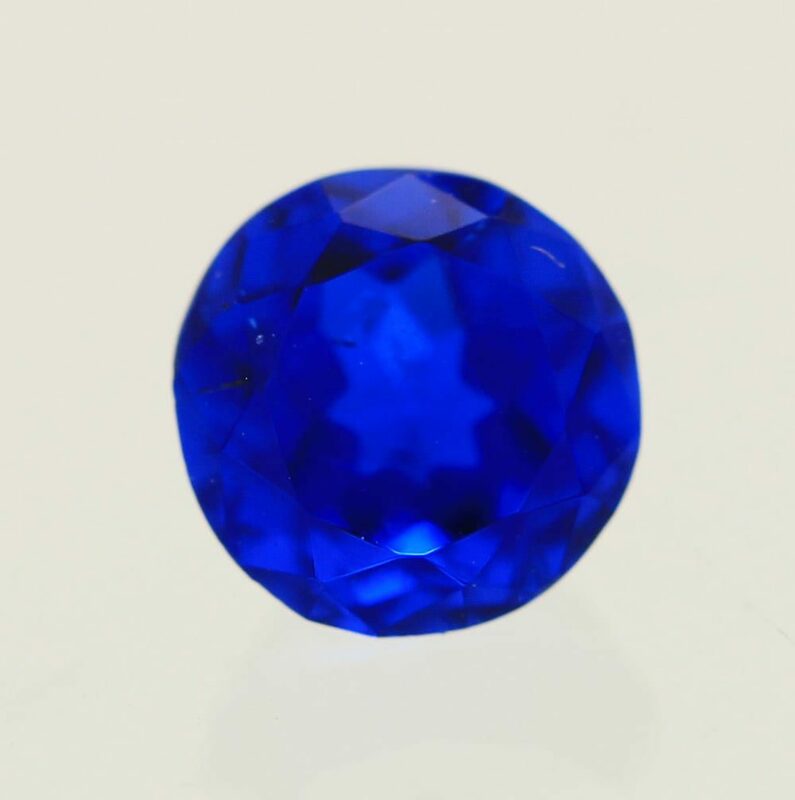 Imagine the appeal of a stone the color of lapis but faceted and transparent. Haüynes, crystals in vug and loose crystal (0.5 cm across), Mayen, Eifel Mts, Rhineland-Palatinate, Germany. © Rob Lavinsky, www.iRocks.com. Used with permission. Haüynes have a slightly blueish to colorless streak. Since streak testing can damage or destroy a specimen and most gemstones leave a colorless streak, don’t try this test on suspected haüynes. Tanzanian material has a lower refractive index (RI) and higher specific gravity (SG) than other haüynes. Note that glass has RI, SG, and hardness values that overlap those of haüyne. (Glass pieces, of course, can come in any color). A spectroscopic reading of absorption spectra might help distinguish these materials. Pair of round haüynes, 2.2 mm, Eifel, Germany. Photo courtesy liveauctioneers.com and Simrit Collections. Scientists have synthesized haüynes and lazurites for geological research. However, there’s no known jewelry use for this lab-created material. Paraffin wax has been used to seal fractures in faceted haüynes. 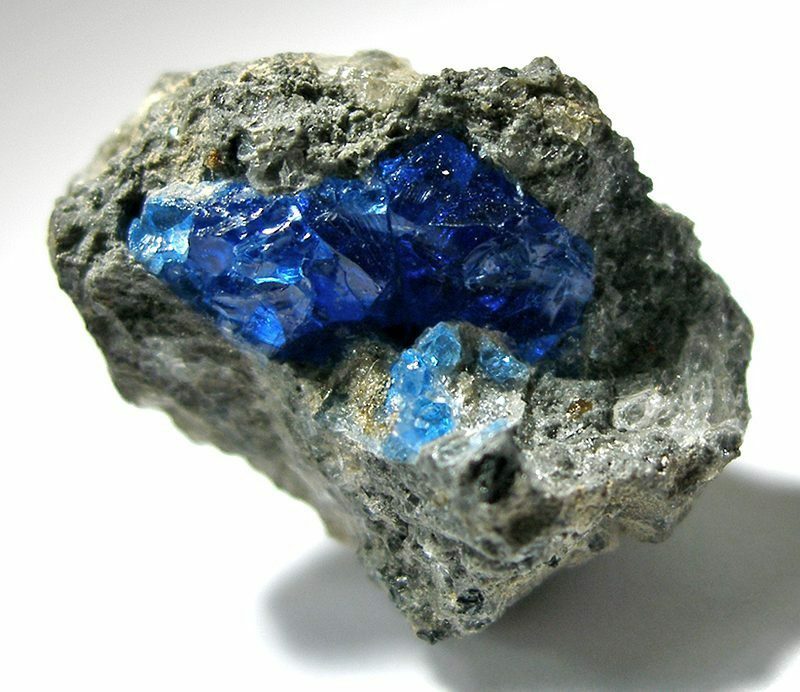 The source of most facetable haüynes, the area around Laacher See in the Eifel Mountains of Germany produces gem-quality, blue, transparent crystals. Afghanistan, Myanmar, and Tanzania also yield gem-quality material. 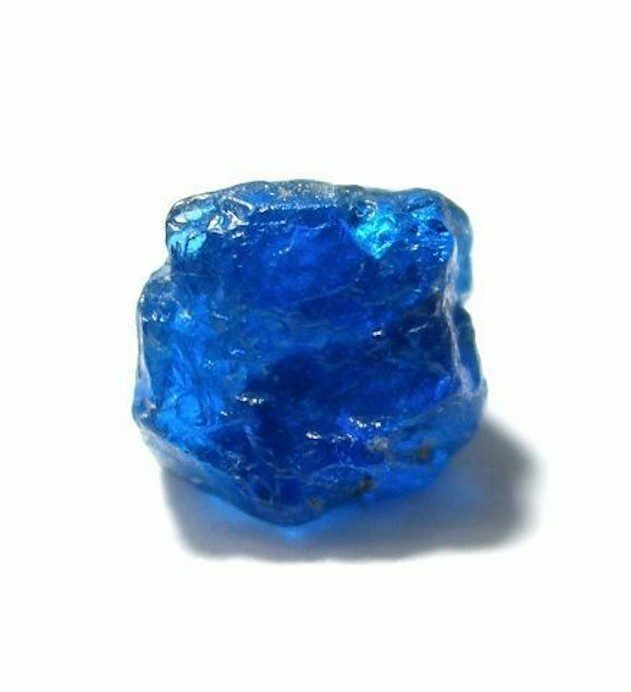 Italy also produces beautiful blue crystals. However, this material is usually too small to cut. United States: Colorado; Montana; South Dakota. Quebec, Canada; Chile; China; France; Morocco; Russia; Canary Islands, Spain; Tahiti; Tajikistan. Haüynes on a basalt vug, crystals up to 1.3 cm in length, Fosso Attici, Sacrofano, Rome, Italy. © Rob Lavinsky, www.iRocks.com. Used with permission. Faceters can cut opaque material into cabochons up to an inch or two in length. 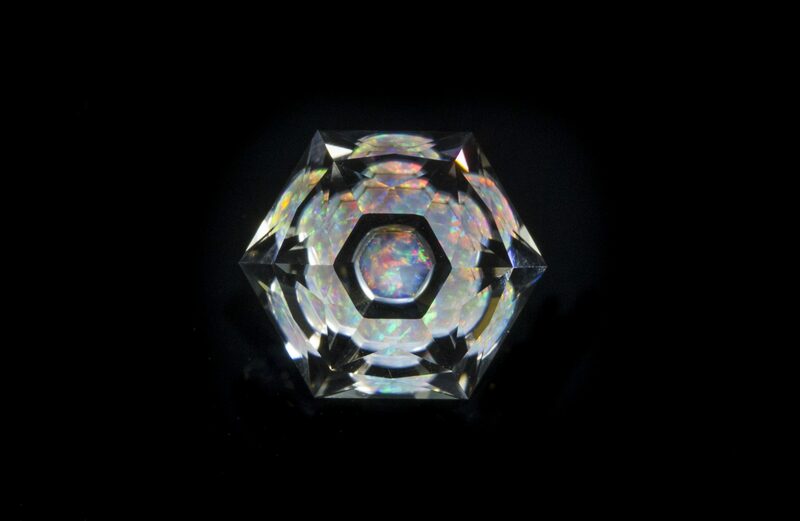 However, faceted gems are exceedingly rare and always small, usually under 1 or 2 carats. 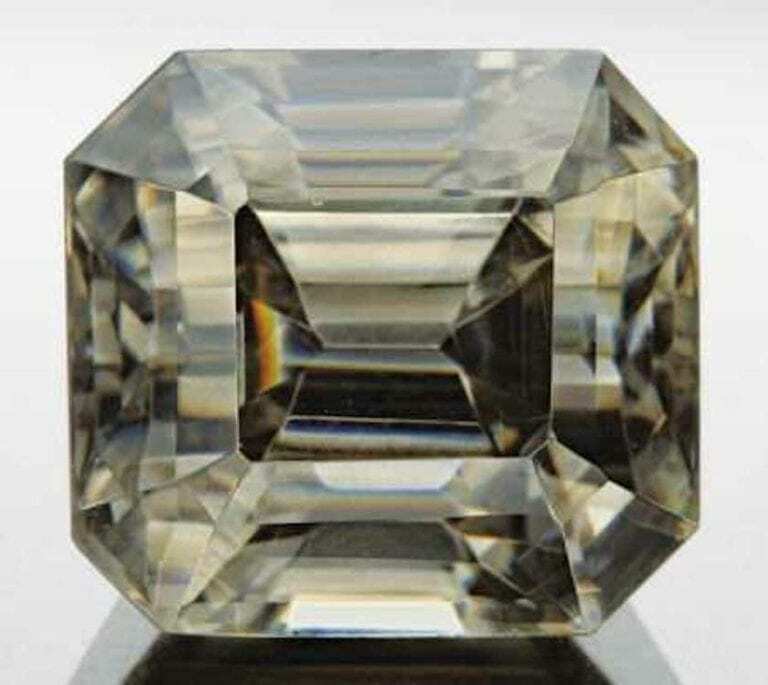 Wide pear-cut haüyne, 0.38 cts, 4.5 x 5 mm, Germany. © The Gem Trader. Used with permission. With precautions, haüynes could make wonderful jewelry pieces best suited for occasional wear. 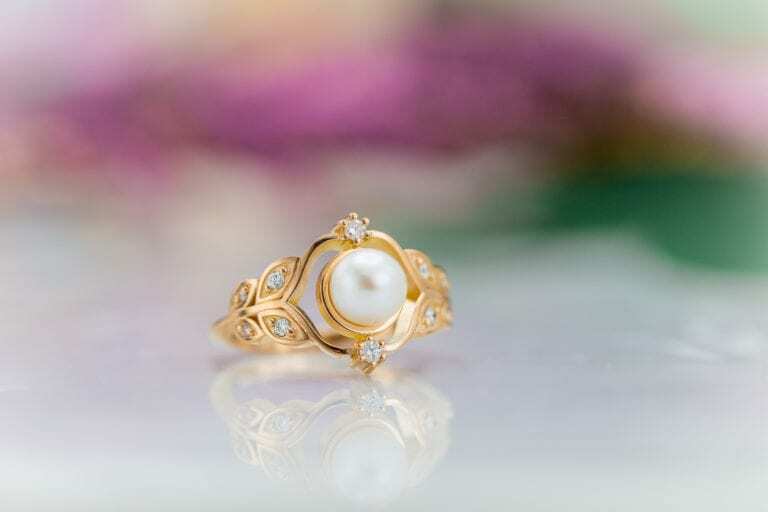 With a hardness of 5.5-6 and distinct cleavage, these stones need protective settings, especially in rings. Clean haüynes as you would lapis lazulis, with a soft brush, mild detergent, and warm water. Avoid chemical solvents and mechanical cleaning systems. Consult our gemstone jewelry care guide for more recommendations. Faceted haüyne gemstones. Photo © Joel E. Arem, PhD, FGA. Used with permission.